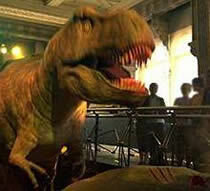 The Natural History Museum was opened in 1881 and has continued to fascinate people since. The building was designed by Alfred Waterhouse and is a sight in itself with tall arches covering the revolutionary Victorian iron and steel framework. There are hundreds of entertaining and educational exhibits, such as the dinosaur collections and the earthquake simulator, which will keep the children happy. A large number of the exhibits were brought back by Captain Cook and Charles Darwin from their voyages around the world. The Museum employs 100 scientists and librarians to continue its research inside the museum. For refreshments there are areas in the basement set aside for visitors to bring packed lunches to eat. While the onsite restaurant, benugo, serves a good selection of hot and cold food and drinks.